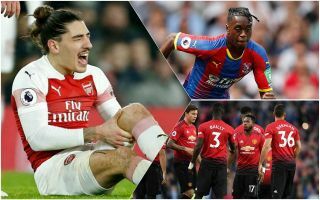 Arsenal have been rocked by the news that Hector Bellerin could now be out injured for as long as nine months. The club’s official site confirmed today that the Spain international has ruptured the anterior cruciate ligament of his left knee. This is undoubtedly a huge blow for the Gunners, who only have the highly unconvincing Swiss veteran Stephan Lichtsteiner as backup, while youngster Ainsley Maitland-Niles can also fill that role, though he normally plays midfield. With that in mind, it’s surely vital for Arsenal to now enter the transfer market for a new right-back. Not the player most Arsenal fans would choose, but Matteo Darmian looked a top talent in Serie A once upon a time and just hasn’t had luck on his side at Manchester United. The Italy international could be worth a gamble for the Gunners, perhaps on loan or on a short-term deal, with the club realistically unlikely to be easily able to afford bigger names. An impressive performer since moving to Leicester City this summer, Arsenal might have to push the boat out a little more to sign someone like Ricardo Pereira. Still, given he can operate as a right-back or a midfielder he could be a more useful long-term option for the club to consider. An exciting young talent breaking through at Norwich City, Max Aarons has actually already been linked with both Arsenal and Tottenham by the Daily Mirror. The 19-year-old could be worth investing in for the future if Bellerin cannot continue to put his injury struggles behind him.